3 What is a morpho-grapheme? 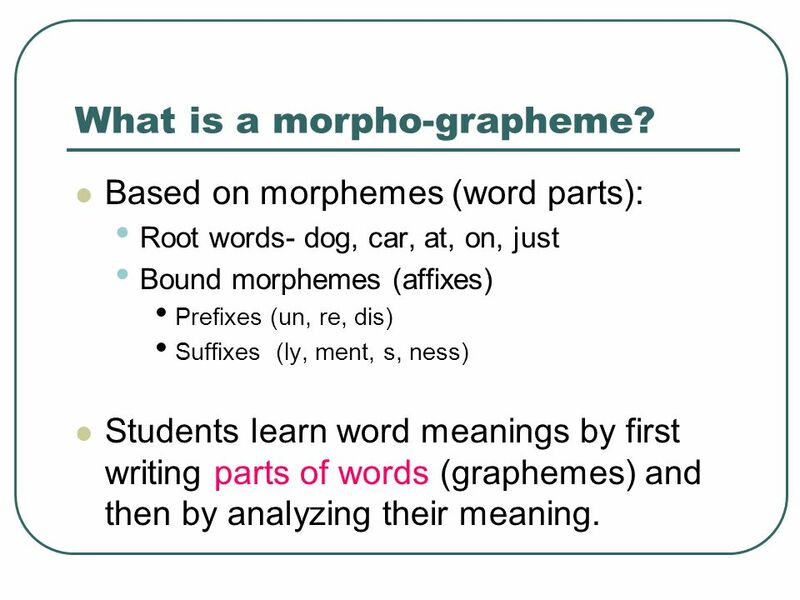 Based on morphemes (word parts): Root words- dog, car, at, on, just Bound morphemes (affixes) Prefixes (un, re, dis) Suffixes (ly, ment, s, ness) Students learn word meanings by first writing parts of words (graphemes) and then by analyzing their meaning. 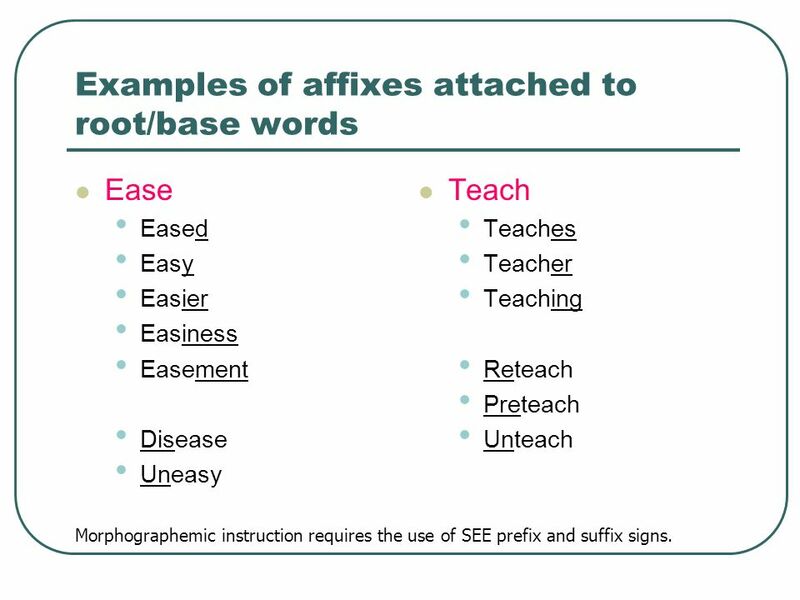 Ease Eased Easy Easier Easiness Easement Disease Uneasy Teach Teaches Teacher Teaching Reteach Preteach Unteach Morphographemic instruction requires the use of SEE prefix and suffix signs. 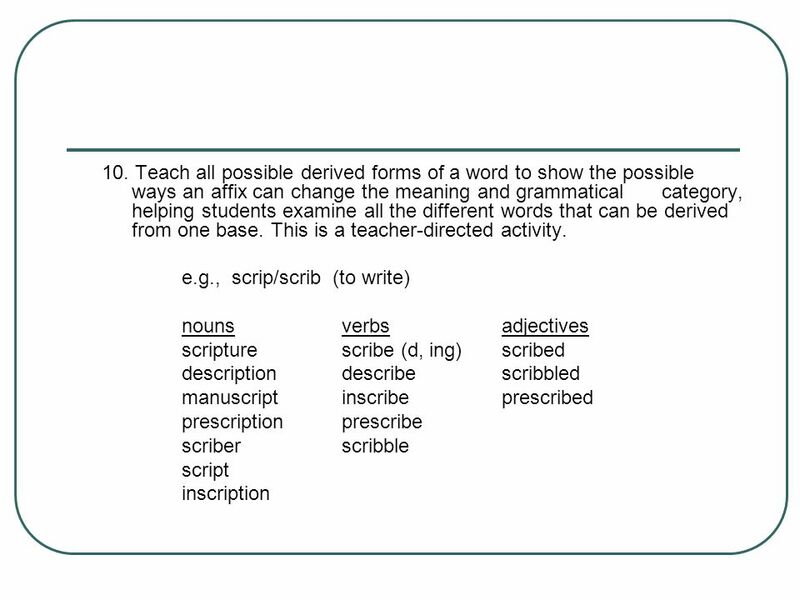 The process of identifying words by dividing them into morphemes or small meaningful units. 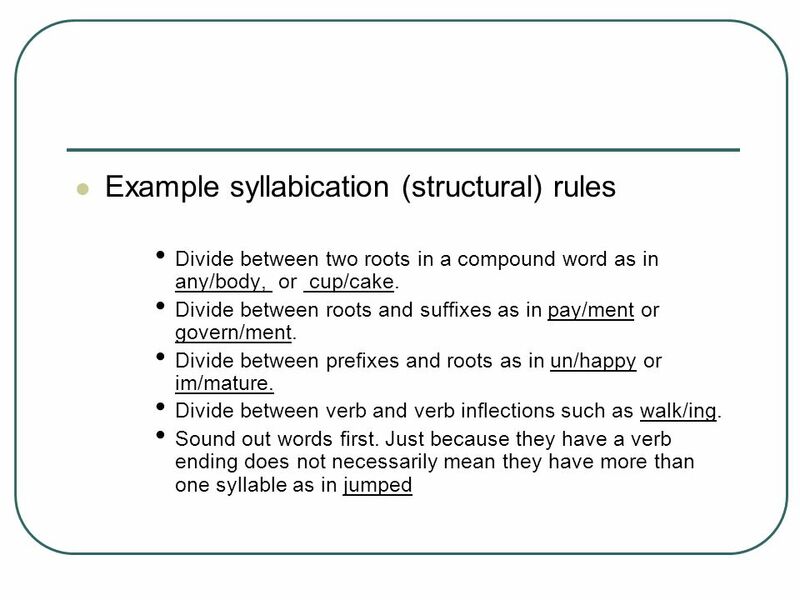 Instruction in structural analysis generally focuses on breaking words into syllables, then identifying their base word and affixes. An affix is something you affix to a base word, as in a prefix or suffix. ALSO FOCUSES ON traditional SYLLABICATION activities. The syllable is the unit of instruction we are interested in. Sound-based. Morphographemics- The relationship between a meaningful unit (or morpheme) and the print unit (or grapheme) that represents it. 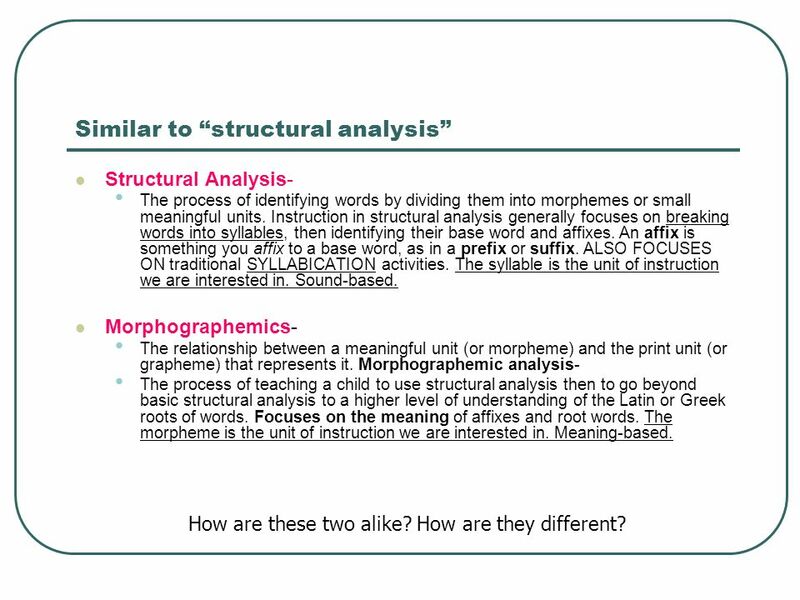 Morphographemic analysis- The process of teaching a child to use structural analysis then to go beyond basic structural analysis to a higher level of understanding of the Latin or Greek roots of words. 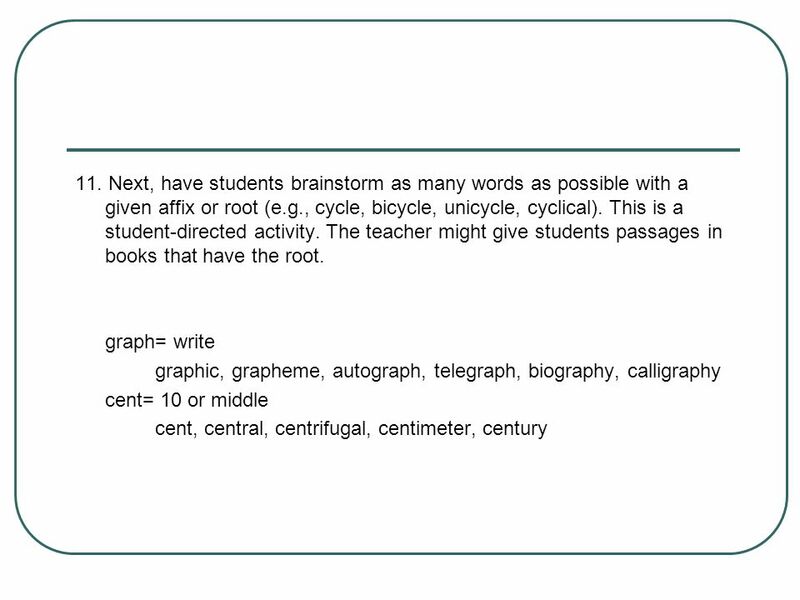 Focuses on the meaning of affixes and root words. The morpheme is the unit of instruction we are interested in. Meaning-based. How are these two alike? How are they different? 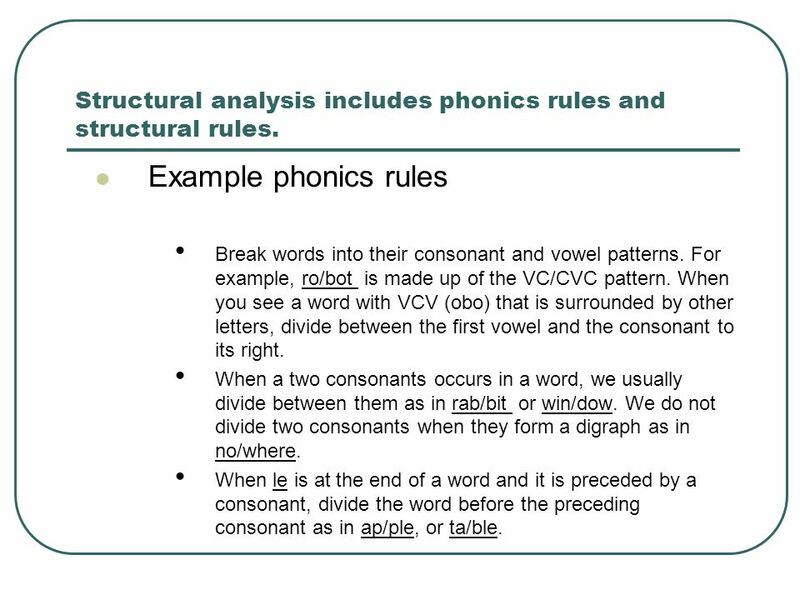 8 Structural analysis includes phonics rules and structural rules. 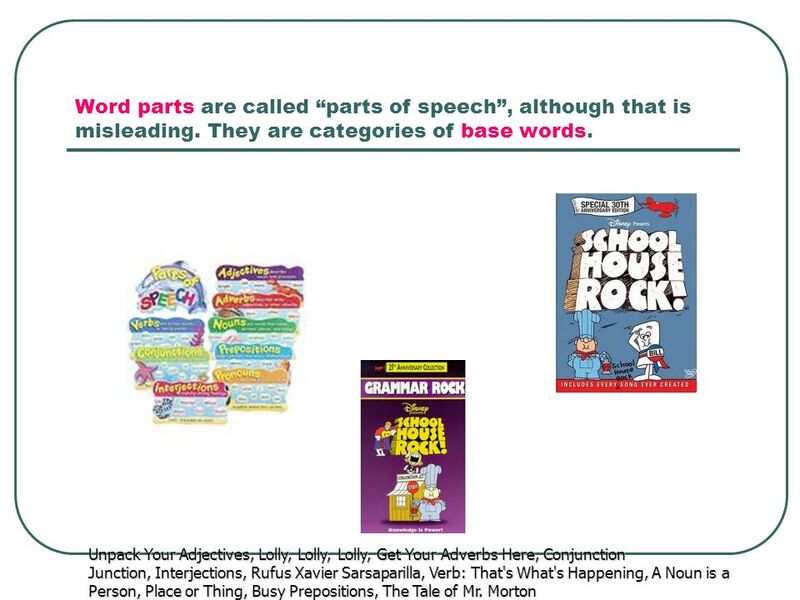 Example phonics rules Break words into their consonant and vowel patterns. For example, ro/bot is made up of the VC/CVC pattern. When you see a word with VCV (obo) that is surrounded by other letters, divide between the first vowel and the consonant to its right. When a two consonants occurs in a word, we usually divide between them as in rab/bit or win/dow. We do not divide two consonants when they form a digraph as in no/where. When le is at the end of a word and it is preceded by a consonant, divide the word before the preceding consonant as in ap/ple, or ta/ble. The patterns of letters are visually mediated and are thus available to the deaf student. You see and sign them, not necessarily say them. Morphographic correspondence in English is more stable and therefore more reliable than graphophonemic correspondence. 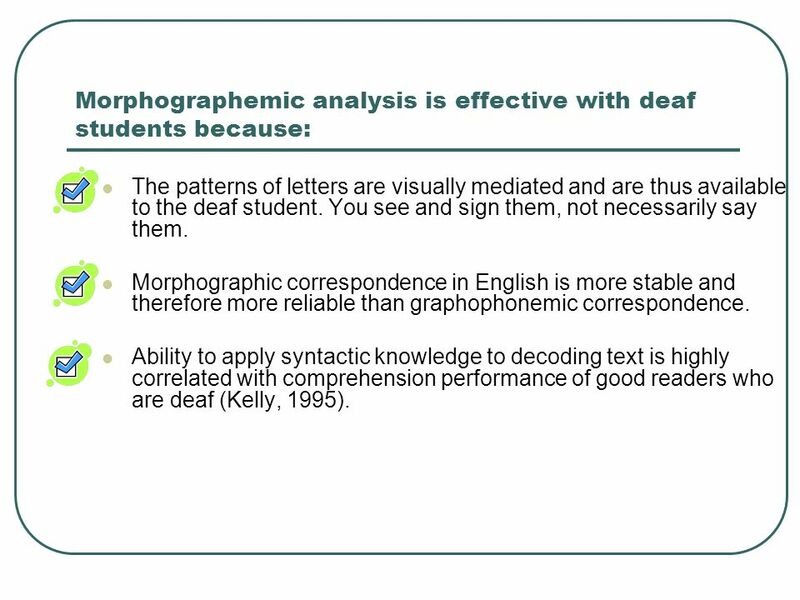 Ability to apply syntactic knowledge to decoding text is highly correlated with comprehension performance of good readers who are deaf (Kelly, 1995). 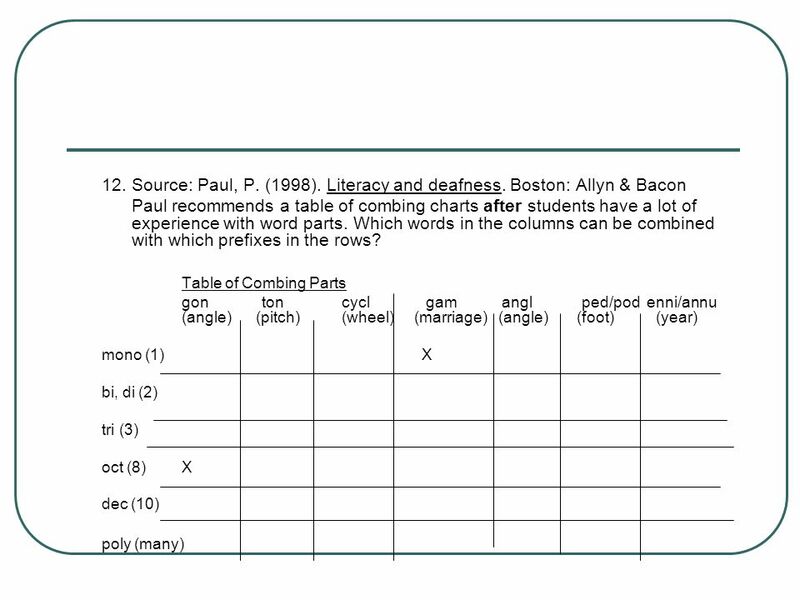 11 Skilled readers who are deaf pay attention to form features of English text more so than poor readers. 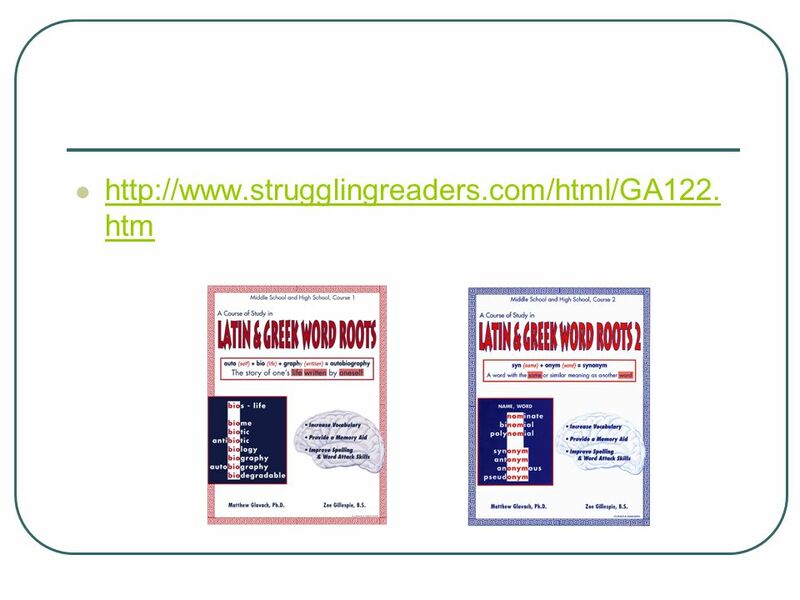 Strong evidence exists for the role of a large vocabulary in reading proficiency, and manipulation of morphological forms is critical to development of more advanced vocabulary. 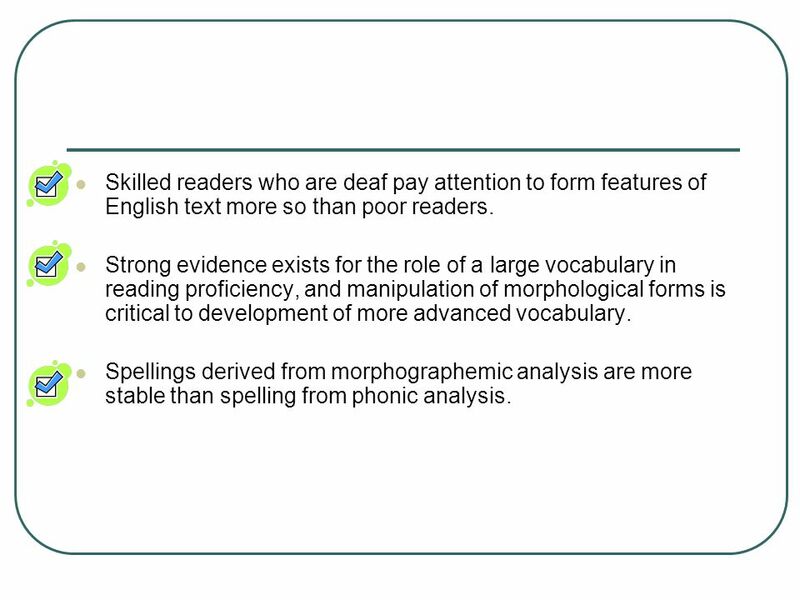 Spellings derived from morphographemic analysis are more stable than spelling from phonic analysis. Embed decoding of the target (e.g., ambi) into meaningful print to ensure comprehension. 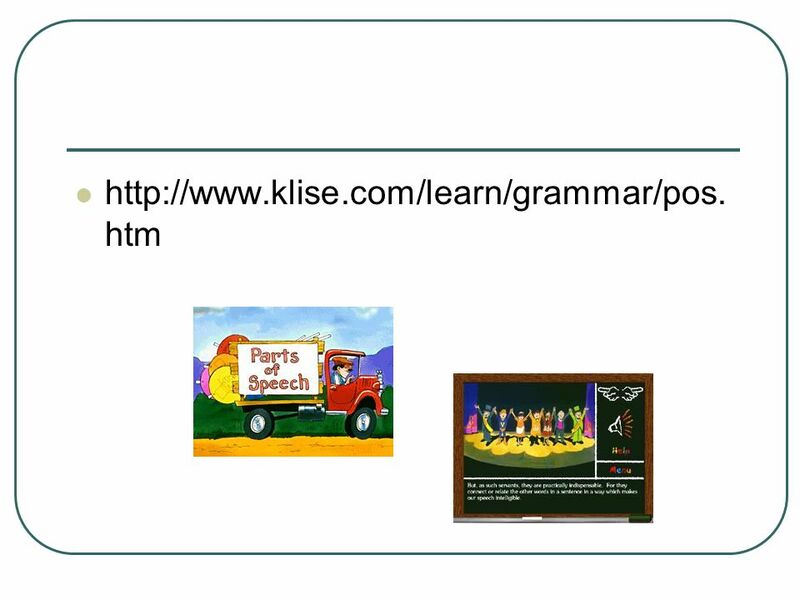 Teach students to decode unknown vocabulary in the context of known grammar and vocabulary. You want to give them as many context cues a possible. 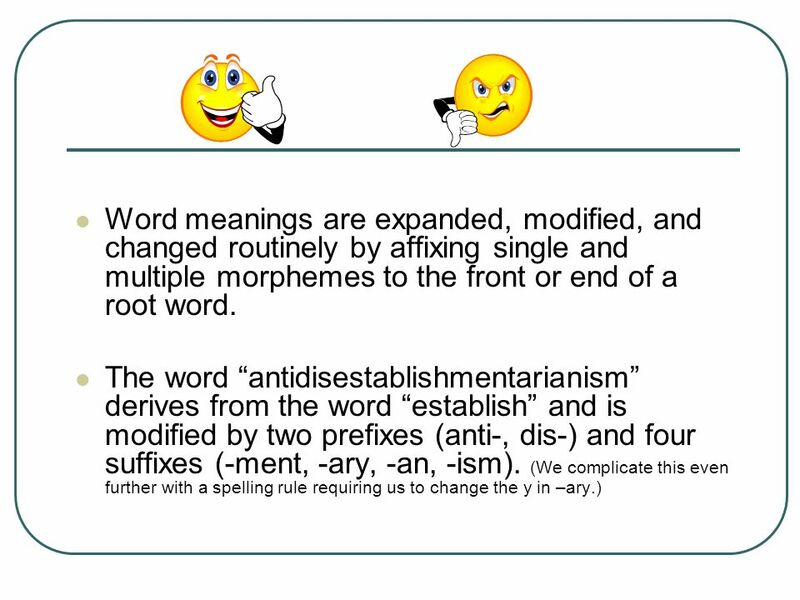 Teach morphographemes by visually highlighting the changes they make to base or root words or to other morphographs (e.g., happy versus unhappy). Next, teach prefixes, suffixes, and compound words. 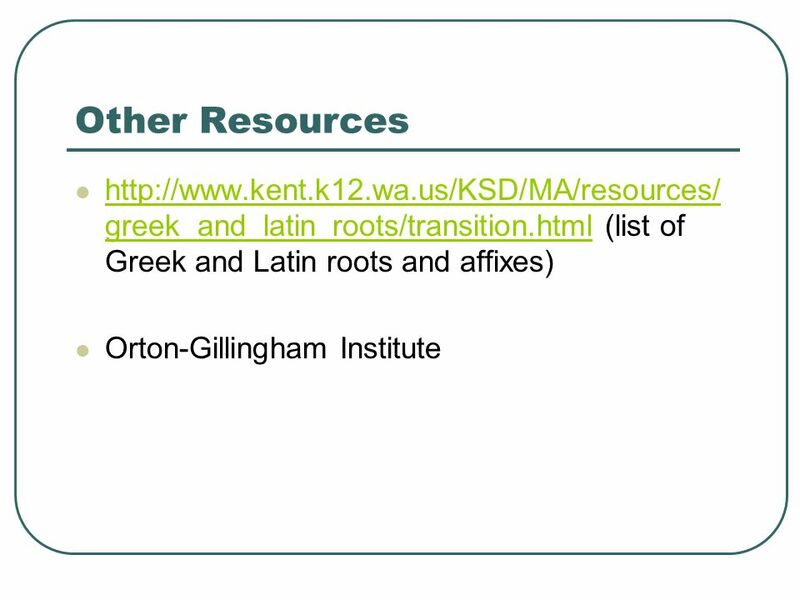 Next, teach Latin roots for numbers as they are most easy to demonstrate visually. 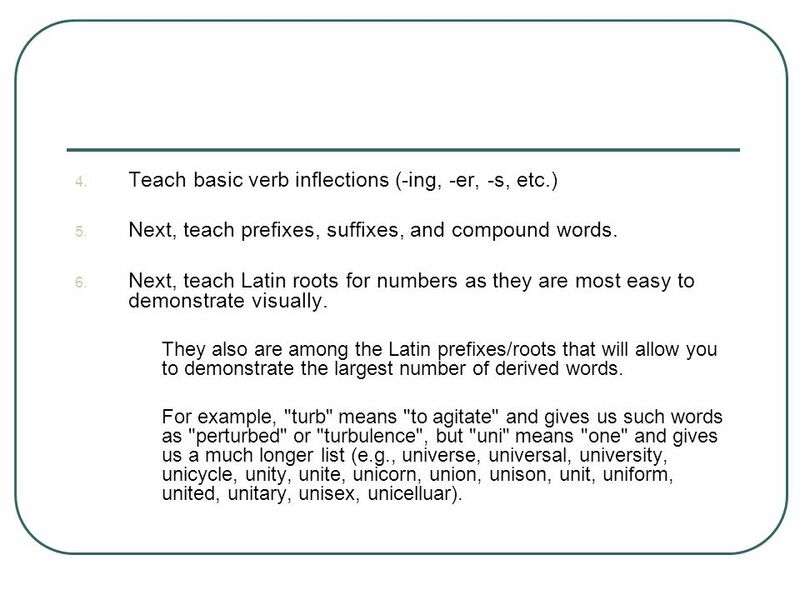 They also are among the Latin prefixes/roots that will allow you to demonstrate the largest number of derived words. For example, "turb" means "to agitate" and gives us such words as "perturbed" or "turbulence", but "uni" means "one" and gives us a much longer list (e.g., universe, universal, university, unicycle, unity, unite, unicorn, union, unison, unit, uniform, united, unitary, unisex, unicelluar). 14 How many feet does this creature have? 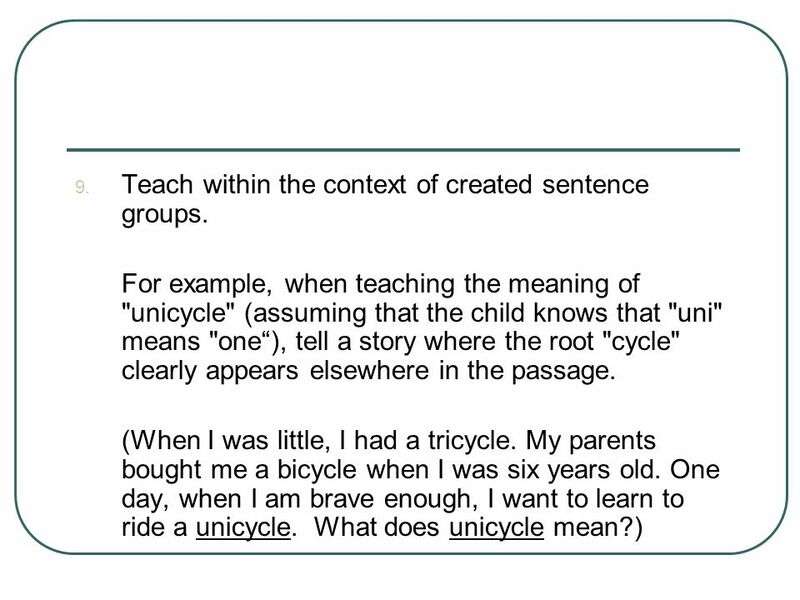 15 Teach within the context of created sentence groups. 19 Activity A ___a. having two angles . 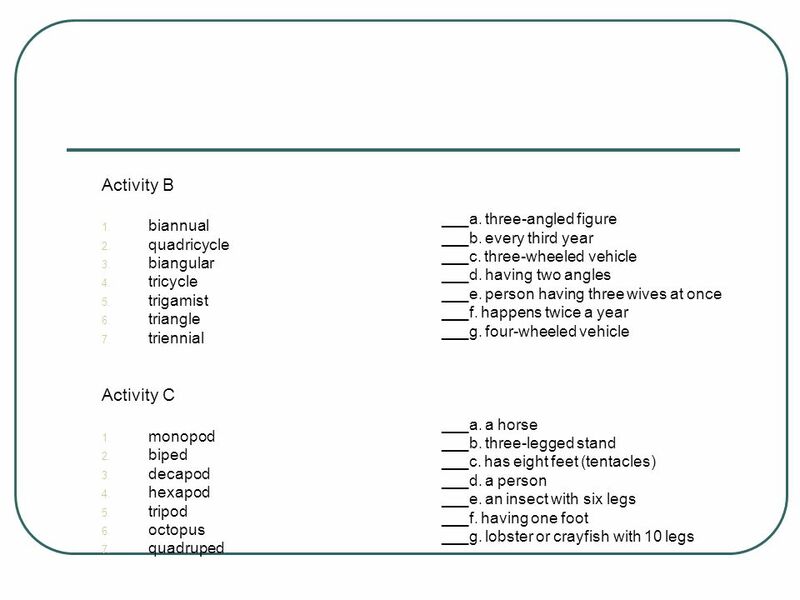 13- Have student use the Table of Combining Parts to complete the following matching exercises Activity A Monotonous Monocycle Monogamy Polygamy Bigonial Bicycle Bigamist ___a. having two angles ___b. having only one spouse ___c. marrying several persons ___d. a person who has two spouses at the same time ___e. always the same ___f. one-wheeled vehicle ___g. two-wheeled vehicle . 21 Remember to use visual and context cues as often as possible. 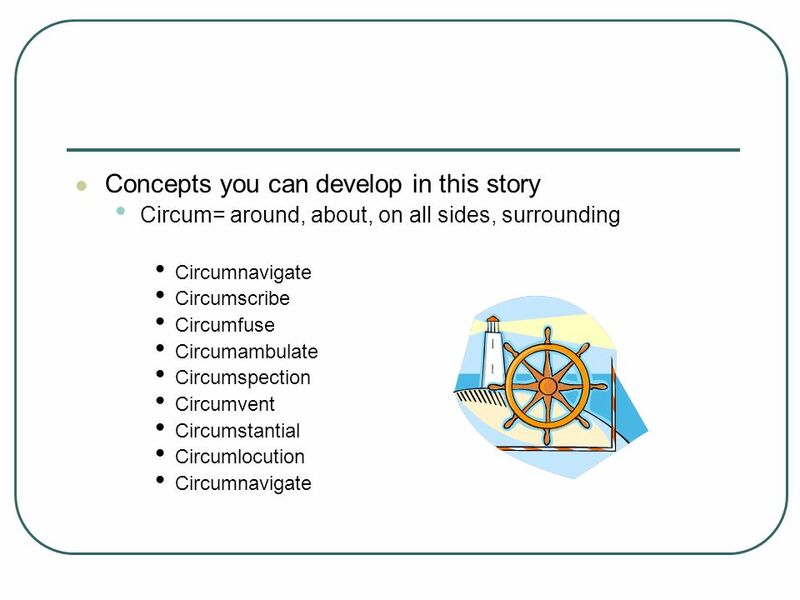 Teaching Tips Remember to use visual and context cues as often as possible. Include advance organizers where possible. 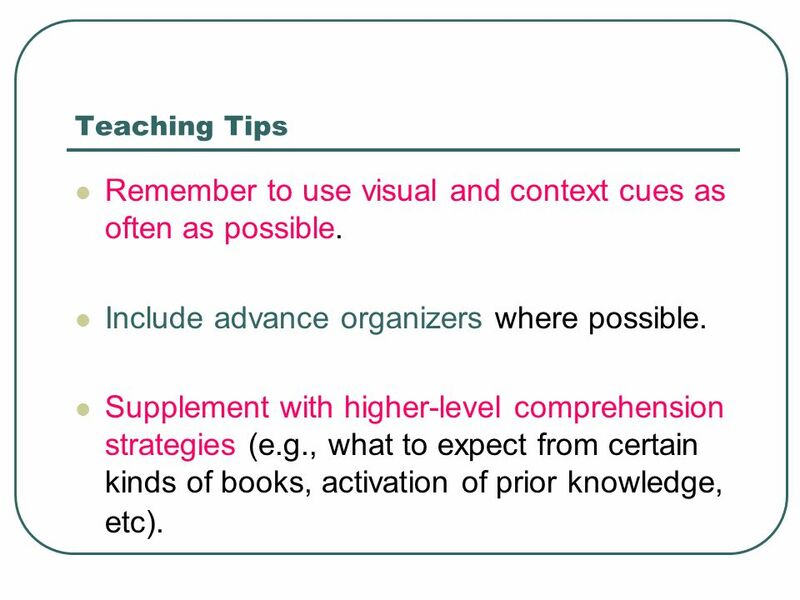 Supplement with higher-level comprehension strategies (e.g., what to expect from certain kinds of books, activation of prior knowledge, etc). 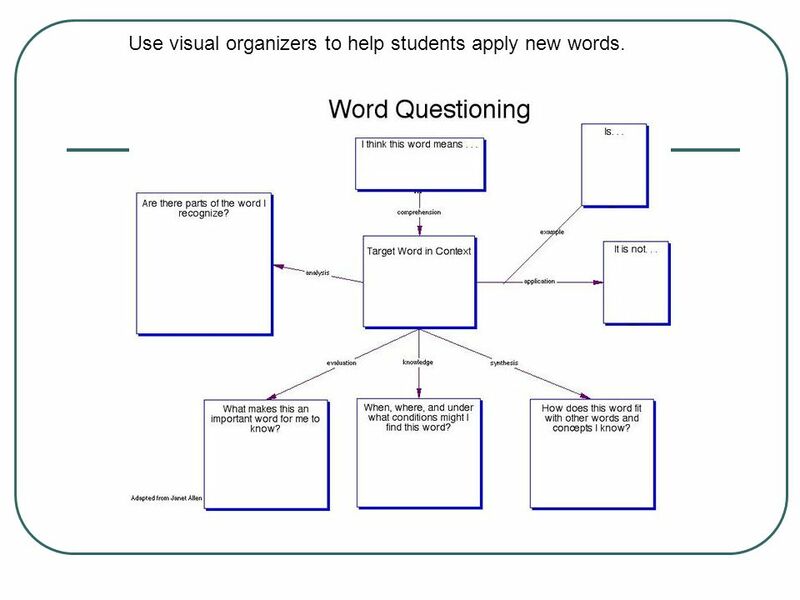 22 Use visual organizers to help students apply new words. 24 Incorporate work into stories, such as this example. 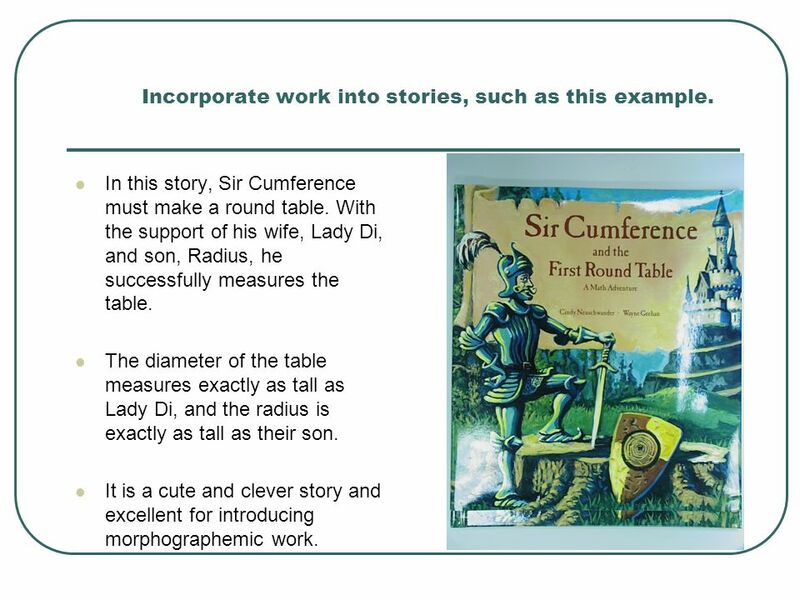 In this story, Sir Cumference must make a round table. With the support of his wife, Lady Di, and son, Radius, he successfully measures the table. The diameter of the table measures exactly as tall as Lady Di, and the radius is exactly as tall as their son. It is a cute and clever story and excellent for introducing morphographemic work. 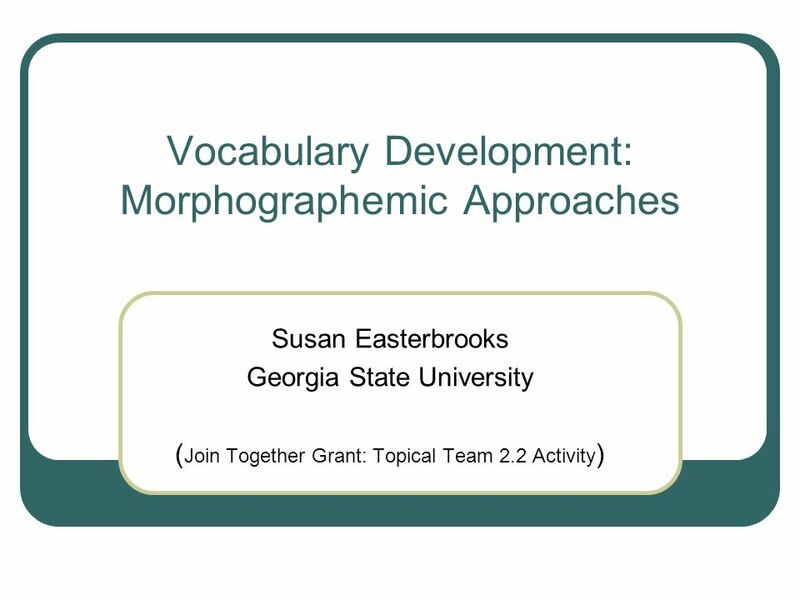 Download ppt "Vocabulary Development: Morphographemic Approaches"
Author: Brenda Stephenson The University of Tennessee Date submitted to deafed.net – Date submitted to deafed.net – March 6, 2006 March 6, 2006 To contact. Spelling Development Students’ spellings are not just random mistakes. There is an underlying logic to students’ errors that change over time, moving from. PHONICS & DECODING Chapter 6. BACKGROUND & RESEARCH By Rachel Jensen. Morphology Chapter 7 Prepared by Alaa Al Mohammadi. 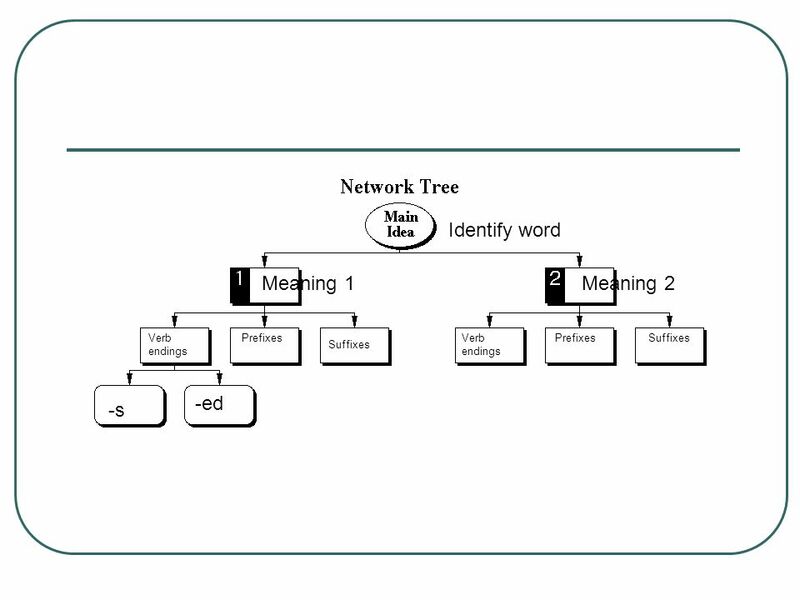 Natural Language Processing Chapter 2 : Morphology.